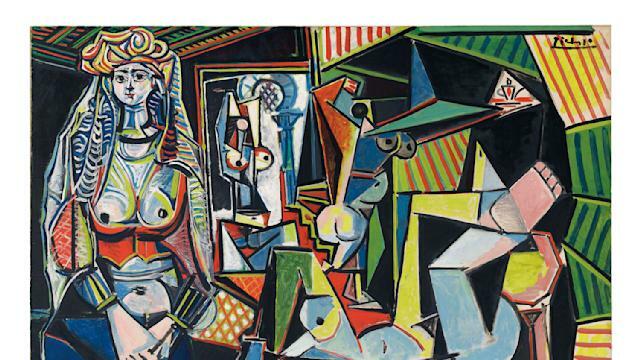 NEW YORK (AP) — A vibrant, multi-hued painting from Pablo Picasso set a world record for artwork at auction, selling for $179.4 million on Monday, and a sculpture by Alberto Giacometti set a record for most expensive sculpture, at $141.3 million. Picasso's "Women of Algiers (Version O)" and Giacometti's life-size "Pointing Man" were among dozens of masterpieces from the 20th century Christie's offered in a curated sale titled "Looking Forward to the Past." 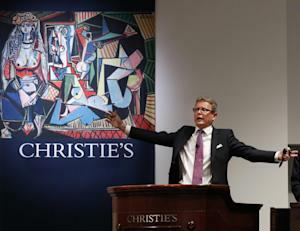 Christie's global president, Jussi Pylkkanen, who was the auctioneer, said the two pieces are outstanding works of art. "I've never worked with two such beautiful objects," he said. 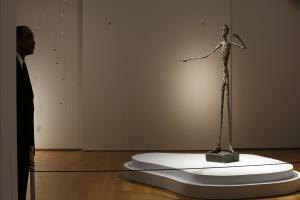 The Picasso price, $179,365,000, and the Giacometti price, $141,285,000, included the auction house's premium. The buyers elected to remain anonymous. Overall, 34 of 35 lots sold for an auction total of $706 million. Experts say the high sale prices were driven by artworks' investment value and by wealthy collectors seeking out the very best works. "I don't really see an end to it, unless interest rates drop sharply, which I don't see happening in the near future," dealer Richard Feigen said. Impressionist and modern artworks continue to corner the market because "they are beautiful, accessible and a proven value," added Sarah Lichtman, a professor of design history and curatorial studies at The New School. "I think we will continue to see the financiers seeking these works out as they would a blue chip company that pays reliable dividends for years to come," she said. "Women of Algiers," once owned by American collectors Victor and Sally Ganz, was inspired by Picasso's fascination with 19th-century French artist Eugene Delacroix. It's part of a 15-work series Picasso created in 1954-55 designated with the letters A through O. It has appeared in several major museum retrospectives of the Spanish artist. The most expensive artwork sold at auction had been Francis Bacon's "Three Studies of Lucian Freud," which Christie's sold for $142.4 million in 2013. "Pointing Man," depicting a skinny 5-foot-high bronze figure with extended arms, had been in the same private collection for 45 years. Giacometti made six casts of the work; four are in museums, and the others are in private hands and a foundation collection. His "Walking Man I" had held the auction record for a sculpture: $104.3 million in 2010. Other highlights at Christie's included Peter Doig's "Swamped," a 1990 painting of a canoe in a moonlit lagoon, which sold for almost $26 million, a record for the British artist. Claude Monet's "The Houses of Parliament, At Sunset," a lush painting of rich blues and magenta created in 1900-01, sold for $40.5 million. Christie's also had a Mark Rothko for sale. "No. 36 (Black Stripe)," which had never appeared at auction, also sold for $40.5 million. The 1958 work was sold by German collector Frieder Burda, who exhibited it in his museum in Baden-Baden for several years. Driven up by investors, the vibrant, multicolor piece is the most expensive ever sold at an auction. "Women of Algiers (Version O)"